Hello PDX Time Bank friends! A time bank is a community of members who share their services in exchange for Time Dollars. Earn a time dollar dogwalking and then spend it on getting a hair cut, have a cake baked for you, or any other service that's offered by time bank members. Get involved with the community. Do what you love in exchange for what you need. 1. Submit your application with 2 references we can contact (email contact is prefered). 3. 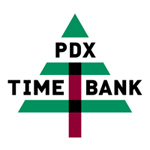 Sign the PDX Time Bank participation agreement. We will be having potlucks every second Sunday of the month as a way to meet face to face and connect! Bring your family, friends, and neighbors to join in this exciting first potluck of the restart! Bring a dish to share and earn a time dollar. Bring a plate and utensils, and let's make this a zero-waste event! We look forward to connecting with you all through the time bank community!